Review Summary: Hollow, lifeless and unoriginal, American Authors deliver an extremely weak debut album that is completely devoid of any emotion or passion. They say you only get one chance to make a first impression, and the first time I heard the mandolin intro to “Best Day of My Life” on the radio, I immediately hated American Authors. From its generic sound to its bland and lifeless instrumentation, the track stole so much from Imagine Dragons’ “It’s Time” that there was no mistaking its unoriginality. Unfortunately, the track doesn’t even come close to the quality of the Dragons’ breakout hit; its similar chord progression and chorus structure are rehashed in an inferior manner that the song comes off as a second-rate copycat. Despite the Boston quartet’s many (and I emphasize the word ”many”) faults, there were still some glimpses of potential buried under its hackneyed songwriting. Although I didn’t expect American Authors to make the second coming of Boxer, I hoped that there would be at least two or three new semi-enjoyable songs that didn’t scream generic within the first ten seconds. Too many of these up-and-coming indie pop acts simply take the sound of more popular bands (examples include Grouplove, New Politics, etc. ), and don’t do anything to make their music unique or distinct. Play ten different songs by ten different indie pop bands, and soon enough all of them will sound the same. It’s a genre where the groups that do become popular end up being of the lowest quality. One could make the argument that the best indie bands aren’t signed to underground labels; however, there are many bands with major label deals that still don’t receive airplay on pop stations. Young the Giant and alt-J both have ties to big names, yet all they can muster is a decent showing on the Alternative charts while missing the Hot 100 completely. Oh, What a Life suffers from the same weakness that plagued their self-titled EP, which is their lack of originality. American Authors don’t have a distinct sound or vocalist, which often causes their songs to sound similar after a while. This could have been avoided had they changed it up a bit – which didn’t happen. Almost every song on the album is a mid-tempo, upbeat generic indie pop tune, and most of them breeze on by without any lasting emotional effect. The only divergences from this formula would be the snoozer ballad-like tracks such as “Home” and the annoyingly perky “Hit It”, which would be a better song if it wasn’t for vocalist Zac Barnett’s irritating ‘woots’. The fast guitar riff provides a nice change in sound, and there’s even a solo. Sadly, a few shining moments can’t save American Authors from the hole they’ve dug. Heavily borrowing from other songs isn’t limited to just “Best Day of My Life” – the chorus of “Trouble” is eerily similar to The Lumineers’ “Stubborn Love”, “Heart of Stone” is pretty much Matchbox Twenty’s “Our Song” 2.0, and “Ghost” takes its cues from “I Believe” by Basic Vacation. Perhaps the greatest crime of them all is when “Think About It” uses the same chord progression as “Best Day of My Life”. Usually when artists rip off themselves, it isn’t on the same album. In a genre that can fall victim to being unimaginative, “Think About It” reaches a new low in laziness. Even though the band’s only good song, “Luck”, is still present, the song has less of an effect here because it’s surrounded by tracks that sound almost if not exactly the same as it. When placed between two of the worst tracks on the EP, “Luck” was a breath of fresh air; without it, the song’s strong suit is diminished and its only redeeming quality is the amount of emotion that Zac Barnett puts into his vocals. Overall, Oh, What a Life comes off as nothing but a lesser version of Imagine Dragons’ Night Visions (which is rather coincidental, considering that they seem to be American Authors’ idols). There is no substance or emotion to be found – every hollow word that comes out of Zac Barnett is polished beyond belief, adding a more pop feel to the tracks. At its core, Oh, What a Life is a pop album, and marketing it as “indie rock” is a serious misnomer; however, it may be too late to stop that. 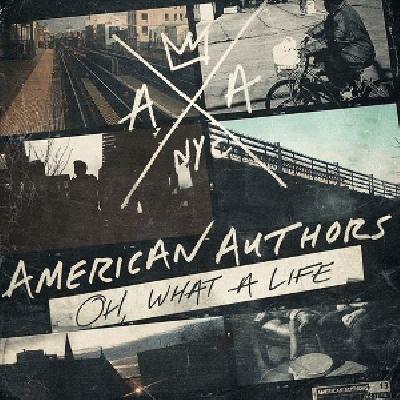 As far as debuts go, American Authors take the tiny sliver of potential they still had and threw it out the window. If they manage to escape one-hit wonder status, I highly doubt anything else they make can be an improvement. I swear to god there are no differences between It's Time and Best Day of My Life. Most annoying song on the radio. And that's saying something. No interest and you further exemplified it. Good review. Ouch. Don't usually see debuts trashed like this. I'm strangely tempted to give it a listen. Of course this has a ballad called "Home" on it. I hate "Best Day of My Life" with a passion. This sounds awful; good review, although it seems like you have a bone to pick with the album and artist. The only good song on here is Believer. Everything else on the album sounds like a copy of Best Day of My Life and Hit It. Ugh Best Day of My Life has been annoying for almost 2 years...why must it just now be getting popular.